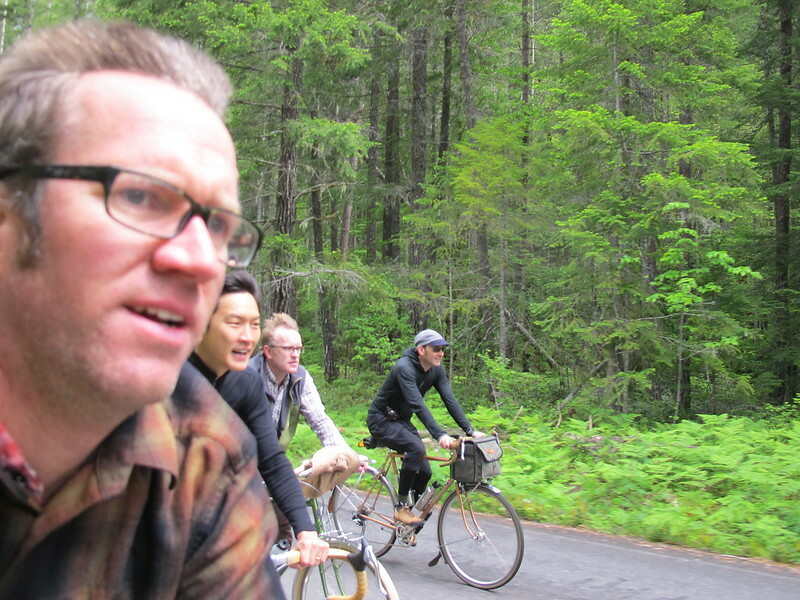 Last month, I met up with some fellow north-westerners for a couple mountain rides between Seattle and Portland. The goal was a nice weekend with a potential shot at going over Babyshoe Pass early in the season. If nothing else, we would see some snow and avoid the bugs that start swarming a bit later in the summer. The 2-hour drive south reminded me why I live here. Lots of wilderness very close to home. I was driving to a rendezvous between 3 active volcanoes in the Cascades mountain range. We would be closest to Mt. Adams with possible views from the ride, but Rainier and St. Helens were nearby, as well. 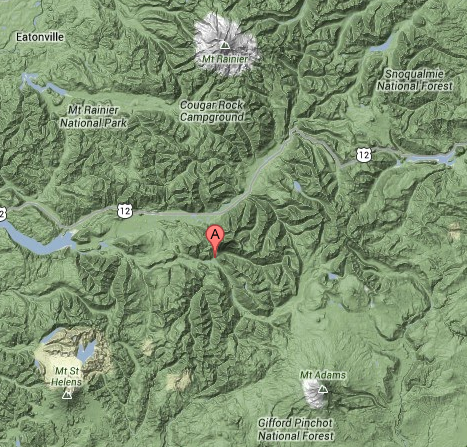 As I got close to Randle, WA, I lost all cell service – this was a signal that vacation time was ON! 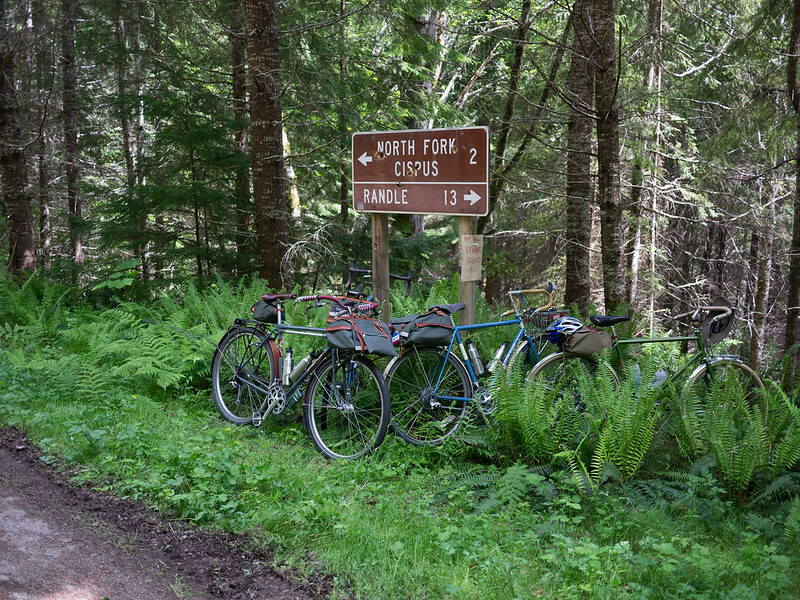 We had reserved a group site at the North Fork Campground 12 miles out of Randle. 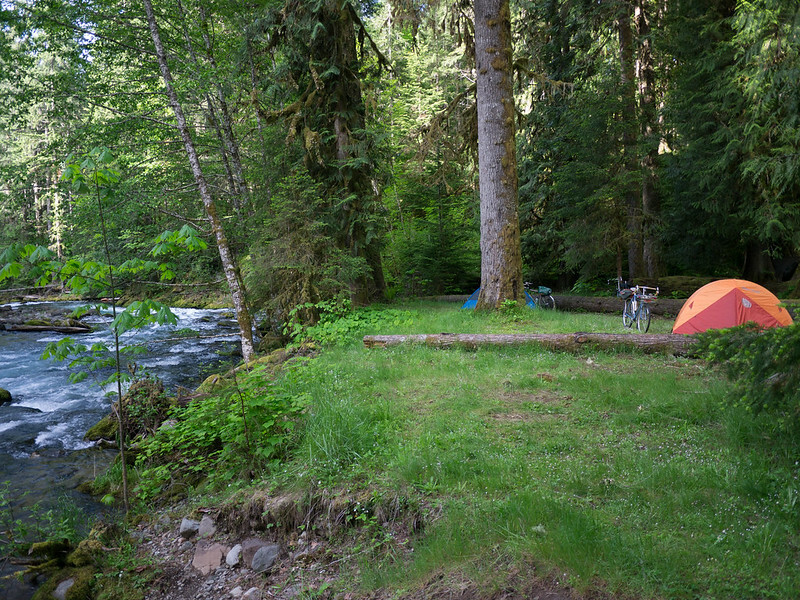 I arrived around the same time as Charlie (from Eatonville), and we started setting up in the reserved spot, but when the rest of the group showed up (Andy, Chris, and Aaron from Portland), we explored a few other sites, and chose one that was right next to the river. Not too many people were camping the weekend after Memorial Day. 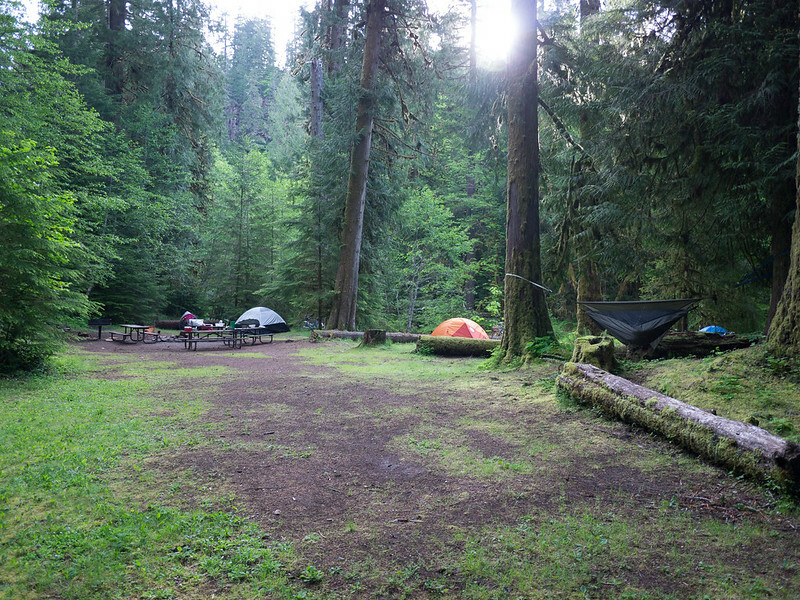 With 4 tents and 1 hammock, we were spread out nicely. Our camp could normally accommodate 20 tents! 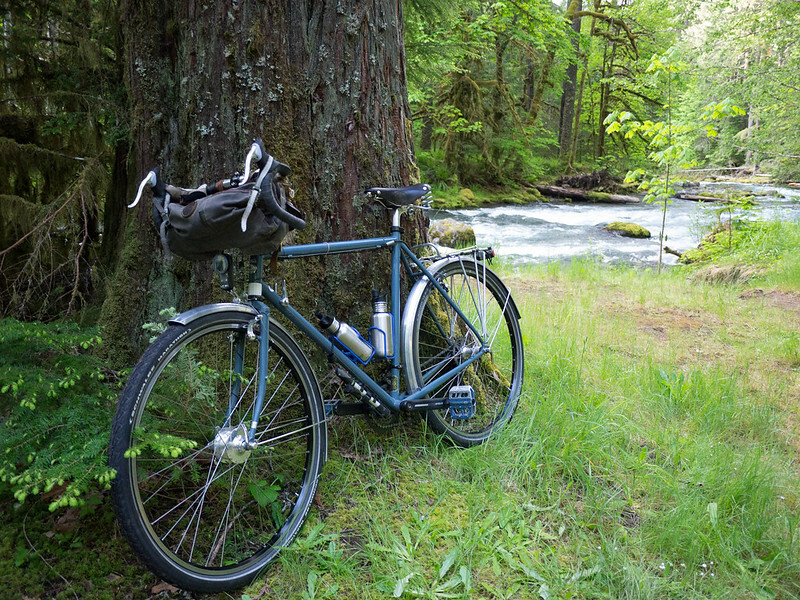 The setting was beautiful Northwest – lush, green, and budding with spring. Ferns, moss, and huge evergreens all around us. It had rained quite a bit before the trip, but we were into a short spell of dry weather. 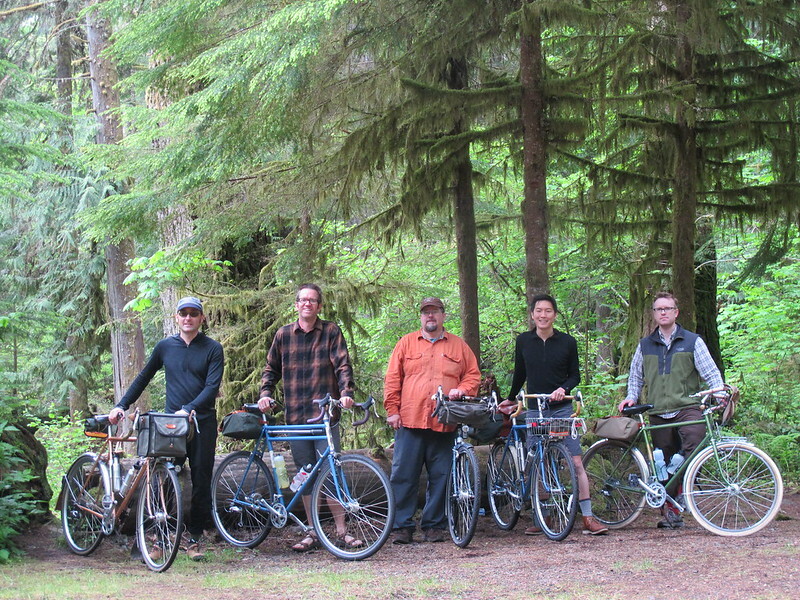 After we set up camp, we set off on the first ride. 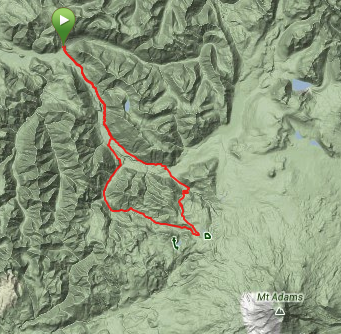 We chose FS 22 heading east, and it was a good immediate climb on gravel. 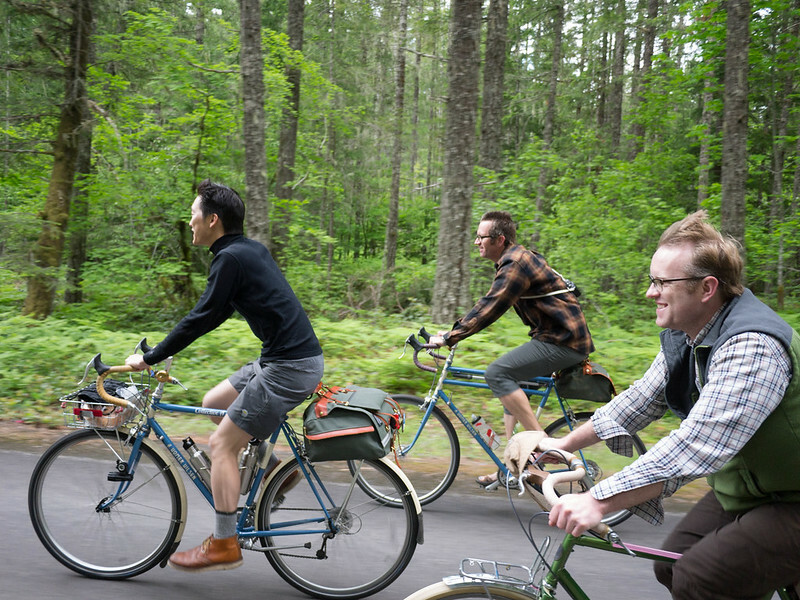 We rode up leisurely as we all got to know each other. 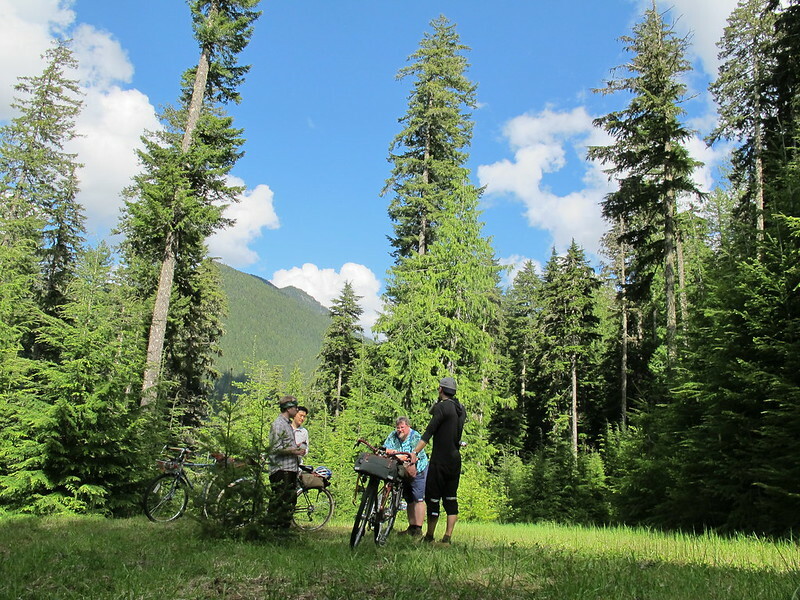 A fair amount of time was spent off the bike taking in the scenery, and just geeking out on our setups. All but one bike was by Rivendell. There were 2 A. Homer Hilsens ridden by Andy and Chris, a Hillborne ridden by Aaron, and Charlie’s lone Surly Long Haul Trucker. I took the Hunqapillar on this ride. Since it was an unofficial “Rivendell ride”, I had both my A. Homer Hilsen, and the Hunqa packed. I wanted to see how they both fared on the rougher mountain gravel roads. I had changed out the Nomad tires for my 50mm Duremes with their more aggressive tread and larger volume. We didn’t get into much nasty trail, but the couple areas of “rough stuff” we hit made me appreciate the mammoth bike’s capacity as a real mountain bike. It rode nicely over everything I threw at it, and it brought back memories of my early ’90s rigid Stumpjumper Pro. The Albatross bars and front V-Brakes proved to be great on the rough trail. We took a side trail up an overgrown trail to a nice meadow with a great view back down the valley we had just climbed. 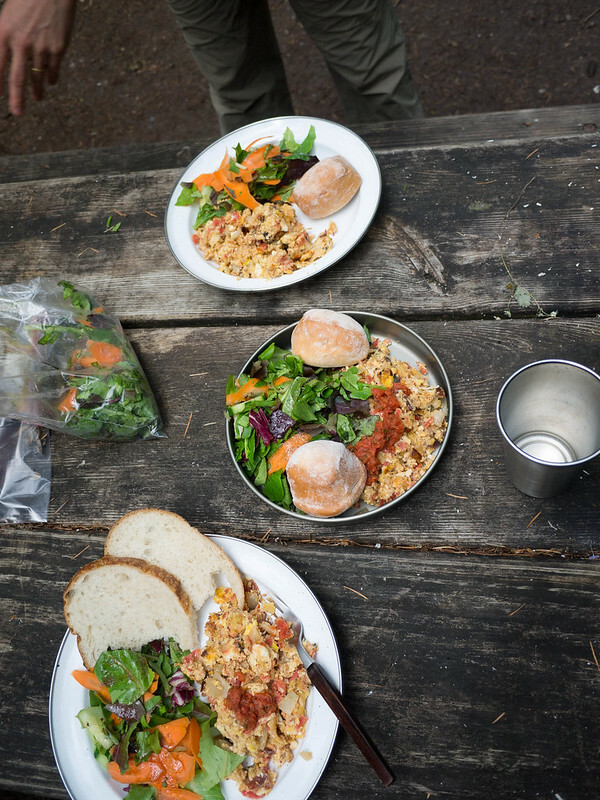 We rested for a bit, and had a snack before making the quick descent down to camp. On the way down, we took another side trail down to the river. 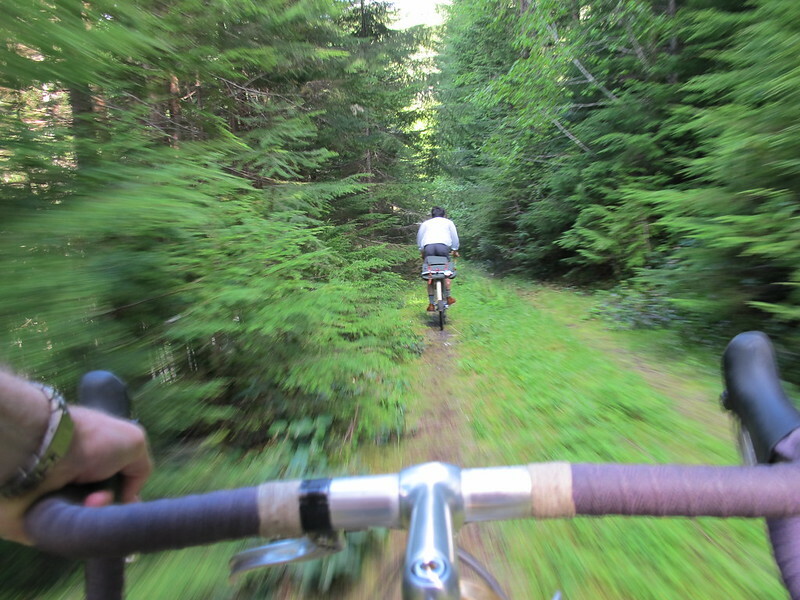 This one was an older, overgrown jeep track and made for some fun riding over roots and blow-down. 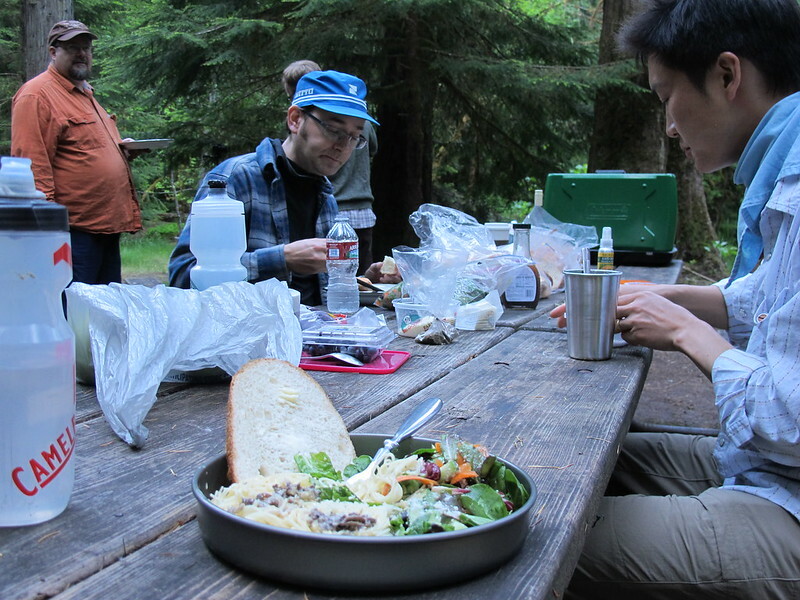 After the nice descent back to camp, the Portland crew set about making a superb dinner of pasta and white sauce with morels and a great salad, while I walked around soaking up the camping atmosphere and helping Andy get a fire started. His chopping knife was a trip! 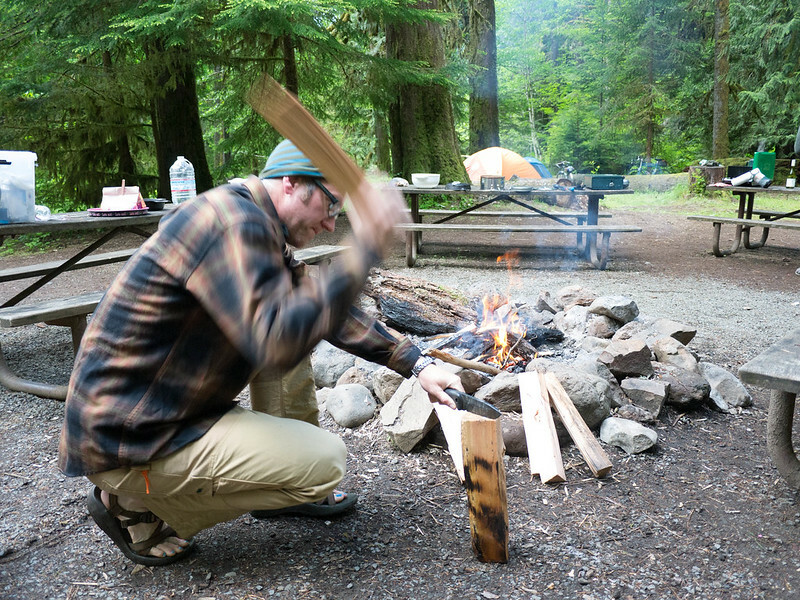 We used that and a hatchet to make up the kindling. Some of the wood was a bit wet, so it was a smokey end to the day. After a late night around the fire, and a great sleep by the roaring river, I felt refreshed as ever. 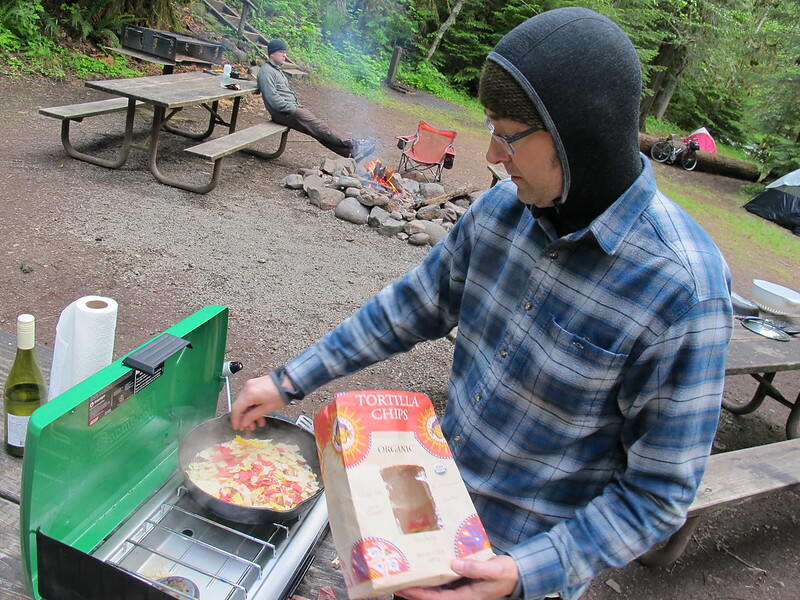 I set about making breakfast and coffee for the campers, and got most of my stuff packed up for a quick getaway after our day-2 ride. Charlie had to get home, so we bid him well, and took our group photos. Ready for the next adventure, we set off on FS 23 with a destination of getting close to Babyshoe Pass and some scenic views of Mt. Adams. Today, it was the Hilsen’s turn at gravel. 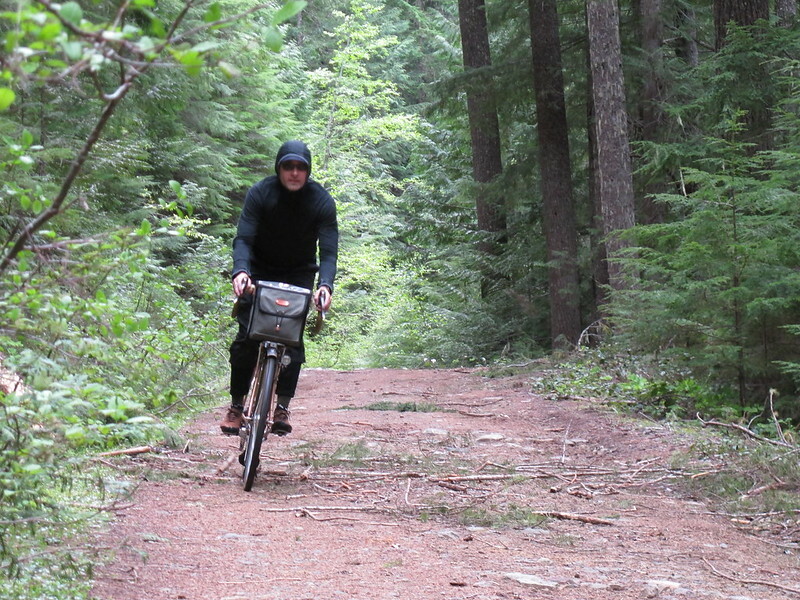 This bike was set up with standard rando gear – trod with Gran Bois Cypres tires, and carrying 2 cameras, rain coat and food in a Boxy Rando bag. We hit the mountains on 3 AHHs and a Sam Hilborne. Today’s ride was a bit more ambitious. If all went according to plan, we would double the distance and elevation of the prior day with around 40 miles and 5000 ft of climbing. With a bit more shade, the day was perfection for a long ride. Amazing views around every corner helped to keep everyone jazzed. Destination snow or Babyshoe. Most likely snow, but who could tell? 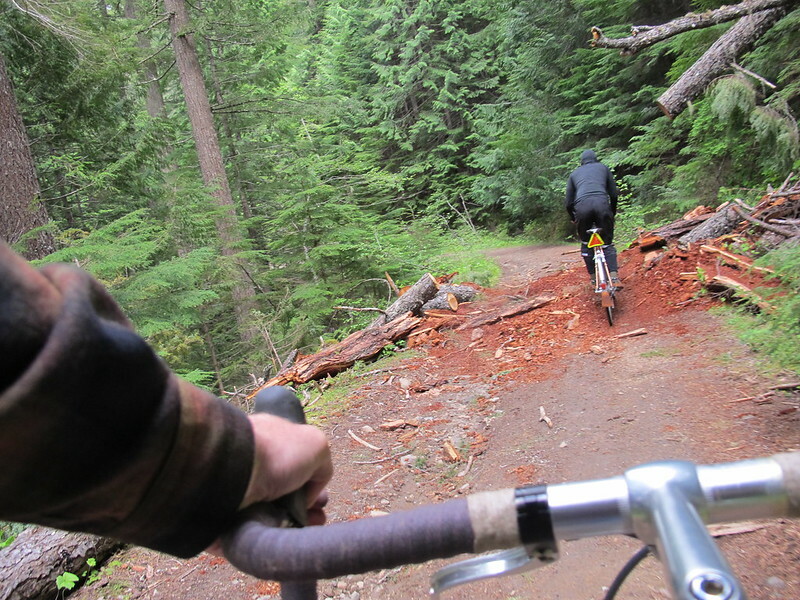 After a while the road turned to gravel, and we started climbing in earnest. 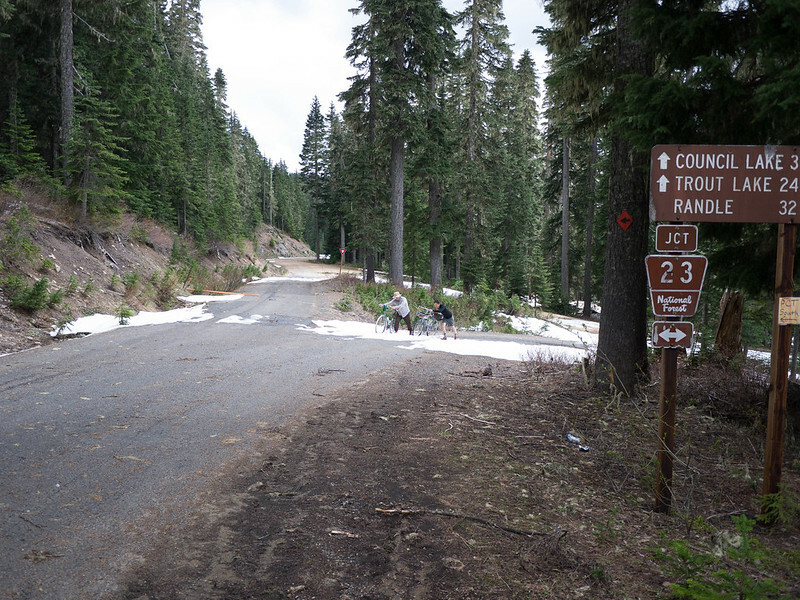 We finally hit snow within a mile of our destination at around 4300′ elevation. 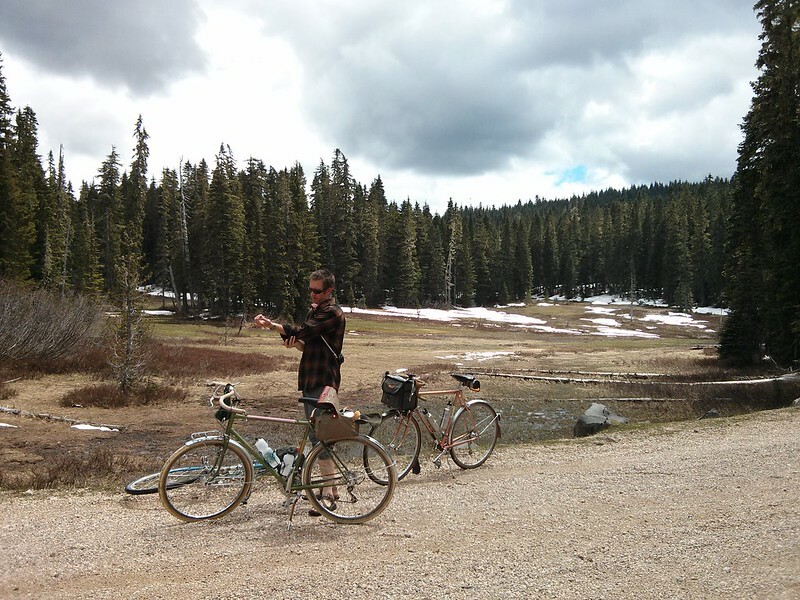 Until we found a meadow, the fork, and paved road again. It was a short respite as we turned around heading NW on the north slope that didn’t seem to want to start declining too soon. 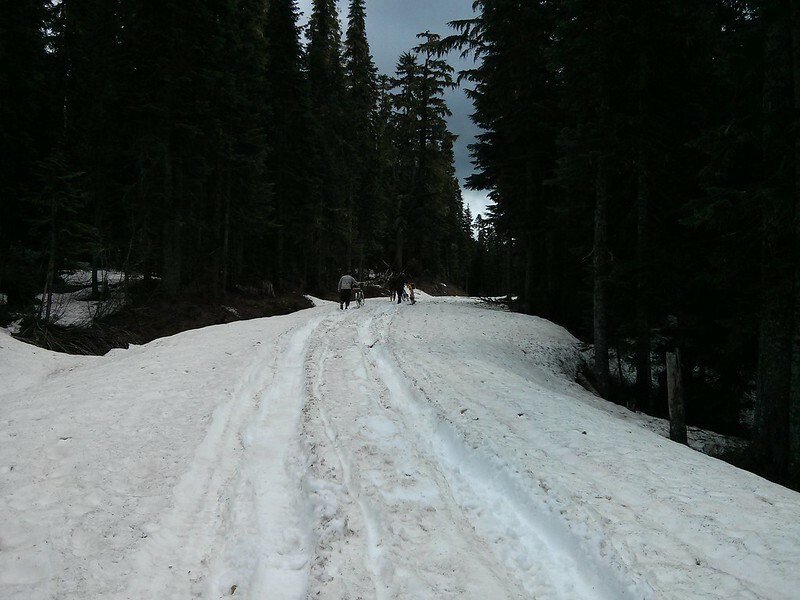 We ended up pushing/straddling our new snow bikes for a mile or so before we ended up back in the mostly snow-free but still very wet next phase of our ride. 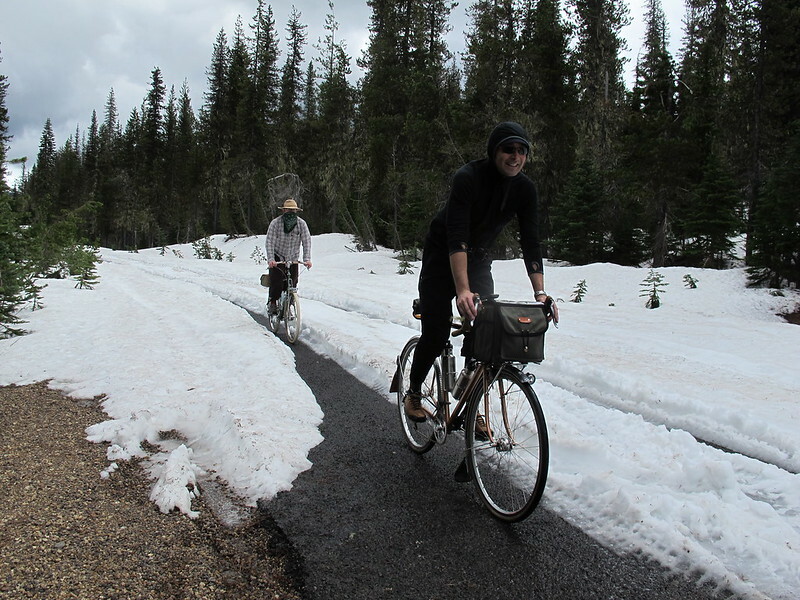 During the snow phase, it was great fun to see how far you could bike in the tire tracks that had been lain some unknown time prior to our arrival. 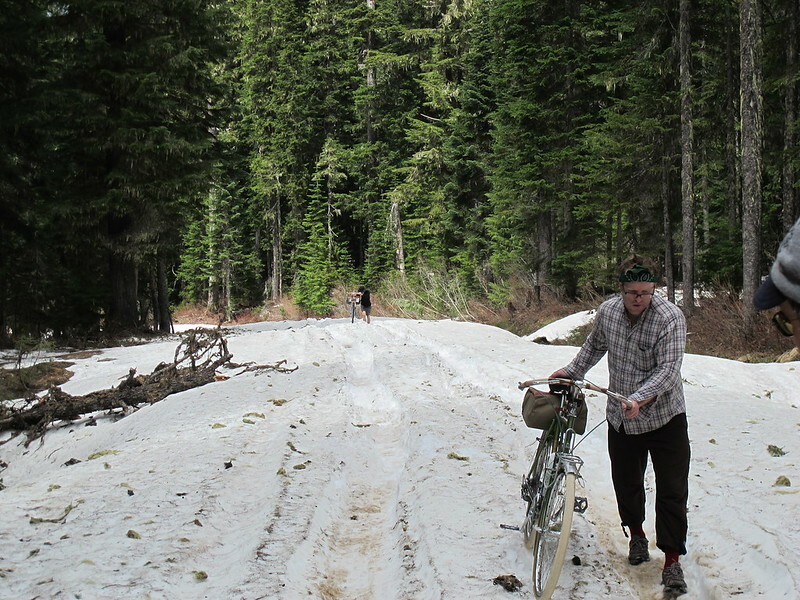 Most of the time, you could sit on the saddle and paddle along with your feet on the raised snow, but if you pedaled, your feet sunk into the banks. I had a successful ride through one of the snow fields, and my confidence was raised enough to try to ride the next one (larger and deeper unbeknown to me), so I got some speed up for the attempt. 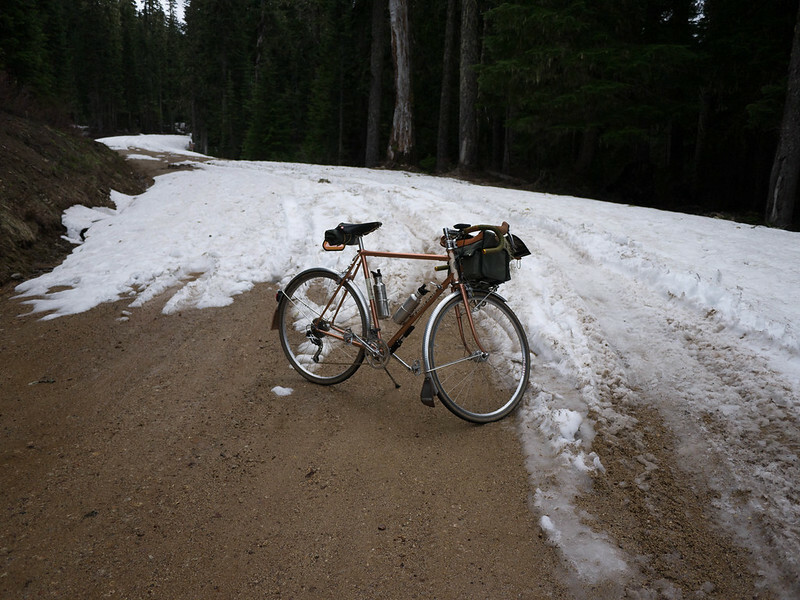 As I started across it, things went sideways – my front tire started out riding up on the old tire tracks, but quickly sunk in. Once that started, it was only a few seconds before it swallowed the wheel enough to catapult me over the bars in a spectacular (to the watching jays) endo, spilling me and my entire bag’s worth of food and camera gear into the snow. Nothing hurt in a snow landing, and the bike checked out. After a hasty re-packing and snow dusting, I was back on my way. After Andy’s toes had thoroughly gone numb in his sandals, the road finally turned back to gravel, but it was not much of a road at that. This was definitely less-traveled with snow melt ruts, random sharp fist-sized stones, and lots of overgrowth to keep you busy. 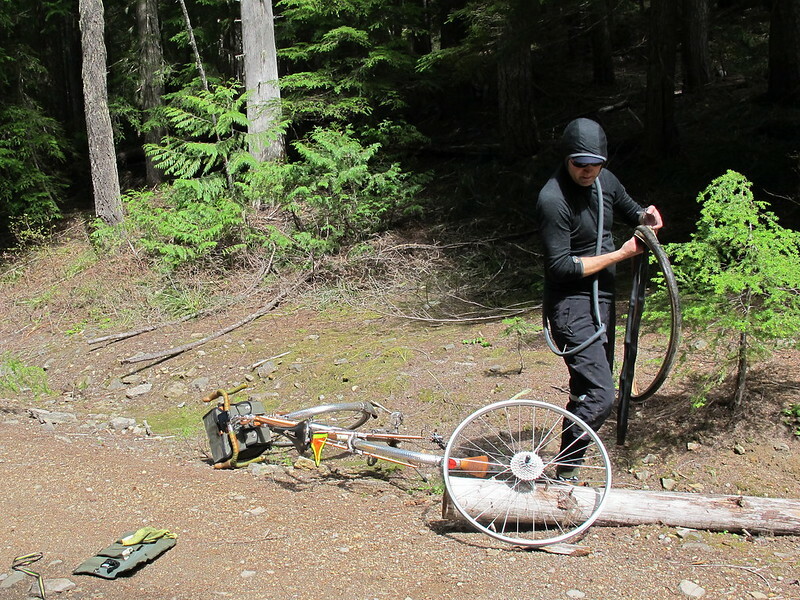 Recalling the joys of descending on a mountain bike, I quickly rode far past my current bike tire’s capacity hitting speeds around 30mph, and suddenly felt my rear tire go limp. 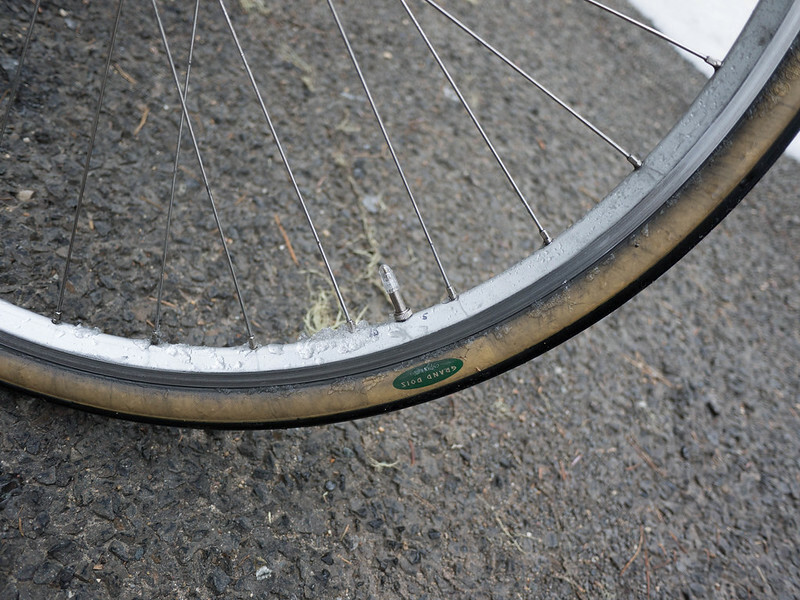 Yes – a pinch flat will kill a descent faster than a broken regulator. After the break, we got back to the art of the fast mountain ride, and had a great time with over 5 miles of glorious downhill under-biking. I had no idea a rando bike with skinny 31mm tires could handle terrain I usually ride on a front suspension MTB. Still, the Hunqapillar may have been a better choice for day 2. I had pushed, and perhaps found the limits of the AHH. With no real harm done, at that. It’s like skiing in the summer! 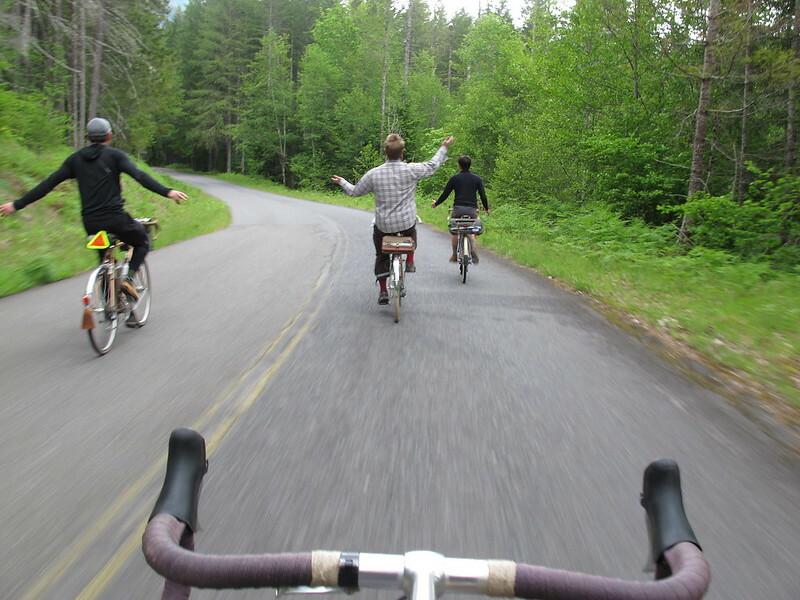 Back on the pavement, I appreciated the final minutes of the ride with new friends. When we got back to camp, we all congratulated each other on an excellent adventure, and vowed to come back in years to come. I am hoping that this was the first of many trips to the volcanoes. With the beauty of the rides, and the amazing lack of population and drivers, it’s a treasure close to home. Brian, I’m curious about the change to a linear pull from the canti on the front of the Hunqapillar. What were the reasons and the results? The bike had shudder while braking with the Tektro 720 canti’s on the front. I had read that a long, exposed cable tends to stretch and contract under braking when the brakes squeeze the rim. The fix is to get a very short cable from the hanger to the brake. I couldn’t find a great way to do this on the Hunqa, so I did the next best thing and put a linear pull brake there. Same idea – actully no exposed cable to the brake. The result is…. no more shudder. Better braking, too. Thanks for the info Brian. I like the classic look of canti’s but linear pulls are so easy to set up and adjust. I tried putting 720’s on my trekking/city bike purely for aesthetic reasons, but the compact mt bike frame just wasn’t designed to accommodate them on the rear. Had to stay with linear pulls. I do like how many of the mt brake levers allow switching between long and short pull. Makes tinkering a bit easier (don’t have to change the brake lever), or in the case of your Hunqa, use the same levers with a canti on the rear and a linear pull on the front. Good times indeed! Nice to re-live the adventure. 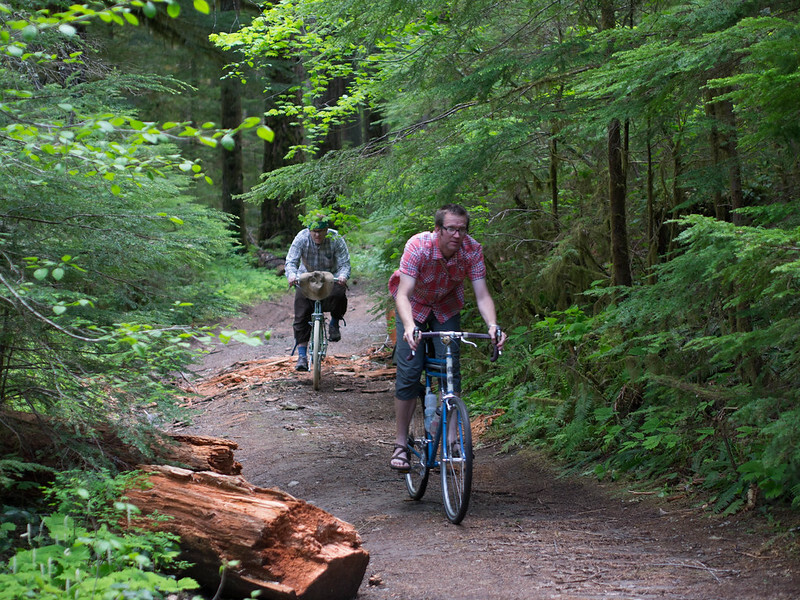 What’s a beautiful and thorough bike route! Fantastic excuse for an adventure, and an enviable setting. Thanks for such thorough storytelling!